Earn 165 - 580 points upon purchasing this product. Use 1650 - 5800 points to purchase this product! Our Organic Barley grass powder is obtained by spray drying the RAW juice extracted from the young soft green shoots of the Barley plant. The height of the plant which is harvested is a maximum of 20 to 30 cm, just before the caryopsis start to grow. This process ensures the product is 100 % gluten free. It is amongst the earliest grown sweet grass in the world, this process is what makes our juice RAW and not to be confused with regular Barley Grass powders which contain high fibre. 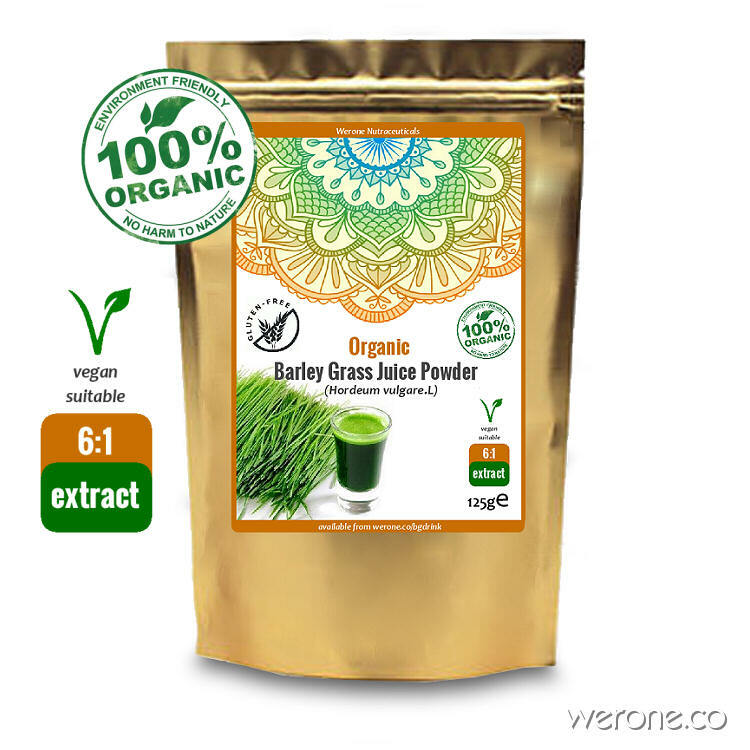 Organic Barley Grass RAW Juice Powder is more convenient to take and better value for money. Just 1 teaspoon is equivalent to 6 teaspoons of ordinary barley grass powder and almost identical to fresh RAW Barley Grass Juiced. Sealed in light proof foil bags to preserve the nutrients. Re-sealable bag, easy to store. Recommended taken mixed into cold or lukewarm liquid (juice, smoothie, water etc). Suggested Usage: Mix 1.5 teaspoons with a glass of filtered water or your favorite juice depending on if you prefer a barley grass “shot” or a less potent beverage. More or less may be used depending on your personal preferences. Add it in your morning smoothie with fruits and veggies. The juice of barley grass contains beta carotene, vitamins B1, B2, B6, B12, pantothenic acid, and folic acid. Minerals present include potassium, calcium, iron, phosphorus, and magnesium. Other constituents are chlorophyll, amino acids, protein and enzymes. it‘s delicious and very powerful! Super product. Not gonna lie! NAC can help treat respiratory conditions by thinning mucus and increase immunity. May be especially useful for chronic bronchitis, bacterial overgrowth and h.pylori. NAC is coveted for its anti-aging properties, most likely connected to its role in the substantial release of glutathione in the body, which fights the cellular damage of oxidative stress, a key to fighting against aging. NAC Inhibits FLU viral replication, also helps with the formation of skin and hair and effects of alcoholic excess. Referred to as Vitamin B complex, VitaB Complex contains the eight B vitamins — B1, B2, B3, B5, B6, B7, B9, B12 and Choline and Bioperine for absorption.. — These play an important role in keeping our bodies running like well-oiled machines. These essential nutrients help convert our food into fuel, allowing us to stay energized throughout the day. While many of the following vitamins work in tandem, each has its own specific benefits — from promoting healthy skin, digestion, nerve health and hair to preventing memory loss, migraines and strong nails. Vitamin D acts in the body as both a vitamin and a hormone, exerting a powerful influence on maintaining bone density and preventing vital steps in the development of breast, prostate and colon cancers (and possibly other cancers) Source. Docosahexaenoic acid (DHA) is an omega-3 fatty acid that is a primary structural component of the human brain, cerebral cortex,skin, and retina. Algae Oil is a purely vegan source of Omega 3 and an exceptional source of DHA. Since the DHA content in most fish originates from algae they consume, the DHA present in algae oil capsule is almost identical to that found in fish supplement, which makes it an ideal vegetarian alternative to fish or cod liver oil. Each capsule provides 200mg of DHA and 100mg of EPA.